Just one dish and four on-hand ingredients are needed to make a surprisingly simple comforting dessert with home-baked quality. Just microwave and enjoy in 15 minutes. 1. Drain peaches, reserving 1/2 cup syrup. Combine peaches, peach syrup, brown sugar and cinnamon in a 1 1/2 to 2-qt. microwave-safe container, such as a deep pie plate or 9-inch square baking dish. 2. Sprinkle 1 1/2 cups granola evenly over fruit. Microwave on HIGH 10 to 12 minutes or until juice starts to bubble up through granola. 3. Carefully remove hot dish from microwave. Let stand 5 to 10 minutes for juice to thicken and cool slightly. Spoon into individual bowls; top each serving with about 1 Tbsp. granola. Serve with frozen vanilla yogurt, ice cream or whipped cream, if desired. 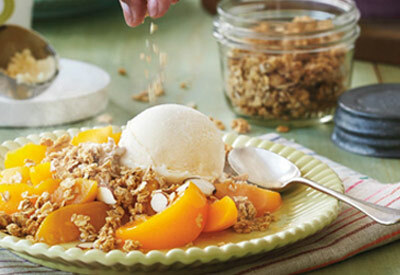 -For Lemon Twist Peach Crisp, add 1 tsp. lemon zest to peaches in Step 1. -For Pear or Peach-Pear Crisp, use 1, 2 or all 3 cans (15.25 oz. each) Del Monte Sliced Pears instead of peaches in Step 1. -For Peach Berry Crisp, add 1 cup fresh or frozen blueberries or raspberries to peaches in Step 1.